Good sleep. Went to church. Struggled to stay awake, but making comments in class helped. The afternoon nap was short due to the need to do home teaching. I felt tempted to complain in my mind, but restrained myself by remembering what others had to do to accomplish what the Lord had asked them in the history of our church. Legs felt stale but not sore. A.M. Ran 3 with Hyrum, Jeff and Daniel in 26:13 - tvpb. Then another 2.5 more with Jeff and Daniel, then Daniel turned around, and I finished the rest of the run - last 0.46 with Jeff as he headed home at that point. Total time for 10 was 1:19:59 - tvpb. Two VPBs was the reason for tempo running today. Timed a quarter in 1:23, and 600 in 2:04. The tempo pick ups felt as good as around mile 5 in the race on Saturday. I think I am still not acclimated to the heat. I could really feel a difference between around 50 this morning and 65 in the race. If anybody wants to read my thoughts on the finisher medals and other token awards, I have added them to my race report from Saturday. P.M. Benjamin and Jenny made me work tonight. Did all of the kids runs with a double stroller loaded with Joseph and Jacob. 1 mile with Julia in 10:47, then 1.5 with Jenny in 12:05, but she closed with a 7:26 mile, and 2 with Benjamin in 14:40 with the last mile in 6:55. Then a nice and leisurely 0.7 in 5:10 without the stroller. Five Fingers - 34.83 miles. A.M. 10 in 1:19:41 - tvpb. First 7 with Jeff and Josse. Jeff's leg was bothering him a bit, he stopped at 7 just ot be sure. Caught up to Sarah with 0.1 to go and finished with her. Just checked our web stats on Quantcast.Com. Record page impressions and uniques yesterday - 9K+ impressions and 450+ uniques. AdSense revenues on running pages are terrible compared to what the Loan Interest Calculator is making. AdSense says you are not allowed to reveal how much you are making, but I think I would still be within the terms of the agreement if I said that if all of my running pages produced as much revenue per impression as the loan interest calculator, I would be able to work on the blog full time. P.M Kids took it easy on me, which was nice since I pushed the double stroller with Jacob and Joseph the entire time. 1 with Julia in 11:19, 1.5 with Jenny in 13:20, 2 with Benjamin in 17:28, and 0.7 alone in 5:18. Five Fingers - 50.03 miles. A.M. Ran with Hyrum, Jeff, and Daniel. Actually did most of the run with them in the vicinity but not with me since I was doing a different workout. First the philosophy behind it. I noticed from the force plate test that my form is very efficient at a slower than marathon race pace. You can see from the force graph that on landing my foot is already going backwards. In the half-marathon and marathon pictures I am often caught in a position that looks like I am about to do a serious overstriding action, but I know I don't - it would have been awfully difficult to run in Crocs, and particularly Five Fingers like that. I think what happens is that I swing my foot forward and then backward right before landing, which is very good - this gives you a forward momentum to start with. The fast speed test was botched, but after some thought I decided to go off with the assumption that the form at faster speeds is not as efficient as it is at slower speeds. I am going off the intuitive assumption that a serious quality breakdown takes place somewhere around 5:10-5:20 pace. Reasons - up to 5:20 I feel I can hold that pace forever. 5:10 is very miserable, I can barely hold it for a 5 K on a good day. Also, intuitively it feels like at slower speeds I have enough time to do my forward-back foot swing, but onces we are sub-5:20, there seems to be not enough time for it. So I want to do an experiment. Can I train myself to do the magic forward-backward swing efficiently enough to stay aerobic at 5:00 - 5:10 pace? Today the experiment started. I did a 30x200 fartlek with the goal of running at around that speed, but the focus being not so much on maintaining the speed, as on maintaining good form. Wearing Five Fingers was a lot of help. I discovered that at those speeds they are different even from Crocs. They put a cap on how hard you can pound the pavement. Crocs do to a certain extent, but not nearly as much as Five Fingers. So you cannot run faster by just hammering harder, which is what I would have done even in Crocs, and especially in racing flats. You have to land a certain way that reduces the breaking and loads the ankle well at the same time, and then time your ankle extension properly and do it very vigorously. If you do it right, you can relax quite a bit more than normal while airborne. I think today I got a glimpse of understanding of how Kenyans and Ethiopians develop a form that helps them go under 27:00 in a 10 K.
The pace varied from 5:00 on the fastest to 5:20 on the slowest. Last night it was windy, and the wind knocked down a lot of branches and twigs. The pace greatly varied with the number of twigs I had to step on. The amount of rest varied a lot as well, but was 100 meters on average. Sometimes I would take a longer break to get to a better section on the trail, and a few times I just ran a full quarter. Total time for 10 miles was 1:16:20. P.M. Had the double stroller with Jacob and Joseph for the entire run except the part with Benjamin. 1 with Julia in 9:58, 0.18 more to drop her off at the church (she got 1.18), picked up Jenny, 1.62 with her in 14:26, dropped her off at the church, 0.18 home. Then 2 with Benjamin in 17:24. Five Fingers - 65.02 miles. A.M. 10.1 with Jeff in 1:19:12. Had a VPB, caught up, thus 0.15 at marathon pace, took me a while to get up to speed. Hyrum joined us for the first mile in 9:28 or so, Daniel joined us for the first 4. We were all asleep, took forever to get going, were getting beat not only by the 8:00 guy but also by the 8:30 boltushka . But then we woke up and ran around 7:10 pace. P.M. 1 with Julia in 9:55, 1.5 with Jenny in 13:22. Julia ran the first 0.18 with Jenny to play with her friend. Then 2 more with Benjamin in 17:14. His friend Stephen joined us for the first and the last quarter. Five Fingers - 79.53 miles. A.M. 10 miles in 1:18:26. Ran with Hyrum, Jeff, and Daniel. Hyrum set a post-break PR of 32:21 in 4 miles with the last 3 in 23:14. And this week he had 80% attendance, which is a record as well. I keep telling him he has a 2:30 marathon in him, but he still does not quite believe me. But we are working on it. Today was a day of singing again. First I sang Come Come Ye Saints at a slightly sub-8:00 pace and then Jeff sang the same song. I got a 2 from Daniel, Jeff got a 7 with 10 being good singing while stationary. Daniel went another 2, then turned around. Jeff ran with me the whole 10. A funny story about Jeff. In his class at BYU they had an assignment to estimate their maximum heart rate. The formula included measurements of weight, height, resting heart rate, and a heart rate at a pace that one thought he could sustain for 30 minutes. It gave Jeff some odd results. He took it to his professor, who said it was not meant to work on somebody who could sustain 5:25 pace for half an hour. P.M. 1 with Julia in 9:58, 1.5 with Benjamin and Jenny in 13:21, 2.5 by myself with 2x400 first down 1% grade, second up, both in 1:17 to feel the 5 K pace for Magna. Five Fingers - 94.53 miles. A.M. Magna Classic 5 K 15:25, 8th place, new course PR. The course in my opinion is equivalent to Carlsbad - aided but at an elevation. You can see the course map and profile at Magna 5K link. At least Dennis Simonaitis ran 14:47 in Carlsbad and 15:00 today, and 14:55 last year in Carlsbad and 15:12 in Magna. Adjusting for putting in less effort in a lower-key race we get the times that are about equivalent. The Course Tool says we are getting about 13 seconds a mile speed up, which would give us a good 40 seconds, which would be 20 seconds more than an NCAA altitude adjustment. In practice, though, I am seeing people run 30 seconds faster at sea-level so I wonder if the adjustment is tailored to make sure that the best altitude runner does not get too much. Also RunWorks.Com calculator says Magna should only be 32 seconds faster than a flat course at the same elevation. Drove up with Jeff, his wife Kimia, Tyler, and Steve Ashbaker the Air Dark Horse. Warmed up 2 miles, and got ready. Trouble at the start: in addition to what I've brought in my car, Teren, Seth, Mike Vick, Dennis, Josh Steffen, and Adam Wende. 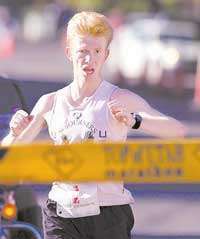 Turned out there was even more trouble - John Cole, a high school runner that has been putting in the miles. Lots of lions going after $275 worth of antelope meat. The gun went off and the lions said: "Grrrr" Went through the first mile in 4:34. Course Tools says it should have been 4:45 for an even effort for this time. It felt hard. We had some sort of a pack. Teren and Seth way ahead, then Mike Vick a little closer, then Dennis, Jeff, Josh, Tyler, John, and myself. In the second mile Dennis made a move. Josh tried to follow. Tyler fell back. Jeff fell back but then passed me and pulled away. 9:26 at 2 miles, 4:52. Course Tool even pace projection was 4:55. I was very happy with that 4:52 mile. Last year my first mile was 4:36, and second mile was 4:59. I expected some difficulty in the last mile given my lack of 5 K training combined with the fast start. But there was not as much difficulty as I expected. We had some tailwind or maybe friendly cross-wind in the first 1.7 miles. However once we turned we had either a headwind or an unfriendly cross-wind. I was drafting behind John, and actually started feeling somewhat good after a moaning stretch, but I did not want to take over as he was going fast enough. I passed him once we turned the corner off 2700 South (around 0.4 to go), then he passed me back with about 0.25 to go, I stayed with him until about 0.1 to go, then he had a kick and I did not. So I ended up in 8th place with 15:23 on my watch, 15:25 officially. This is 19 seconds faster than last year, and a course PR by 6 seconds. Other finishers: Teren 14:12, Seth 14:48, Mike Vick 14:51, Dennis 15:00 (masters course record), Jeff 15:08 (got a $20 piece of antelope meat, last lion that got to eat today), Josh Steffen 15:16, John Cole 15:23, Tyler 15:28 (9th), Steve Ashbaker 16:06 (10th), Adam Wende 16:09 (11th). Zuzana Thomas won the womens in 16:51 (if I remember right), then Carre Joyce 17:02, and Carol Cabanillas 17:08. Ran a moderate length cool down with Jeff, Tyler, Steve, Seth, Adam, and Mike. At home ran 1 with Julia in 9:30 (Benjamin joined us but ran ahead later and finished in 9:04), and then 1.5 with Jenny in 13:23. P.M. 8.05 in 56:43. First 1.05 with Joseph and Jacob in the stroller.